The St. Louis Business Journal honored two University of Missouri–St. Louis alumnae Friday for their efforts to make St. Louis a healthier and more equitable region. 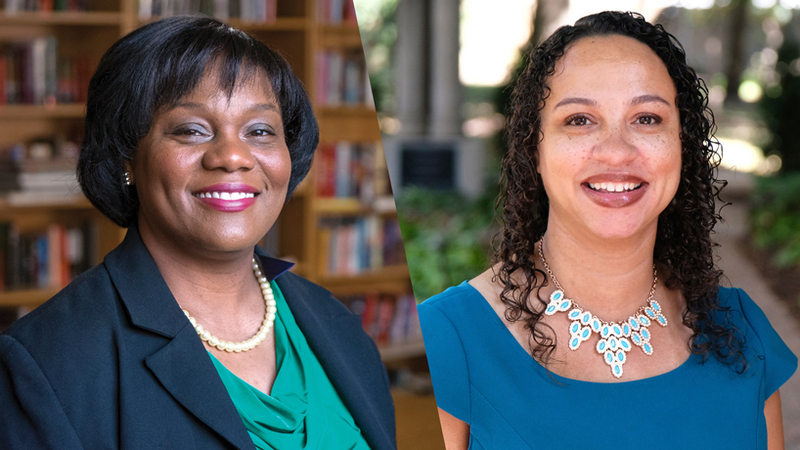 Amy Hunter (BA 1994) and Opal Jones (BSBA 2000, MBA 2017) were among the Business Journal’s 2018 class of Diverse Business Leaders. The cohort of 20 and a crowd of nearly 400 gathered for an awards luncheon Friday at the Marriott St. Louis Grand. Hunter is the manager of diversity and inclusion at the St. Louis Children’s Hospital and is a PhD candidate in UMSL’s College of Education. In 2015, Hunter delivered a TedxGatewayArch talk on how zip codes can serve as an indicator of systemic discrimination. She has now shared the “Lucky Zip Codes” presentation with listeners from around the world. “At St. Louis Children’s Hospital, leaders are everywhere,” she told the Business Journal. “I am happy to extend my strategy for social justice into my workplace. Health equity and the end of health disparities is at the forefront of the work here at St. Louis Children’s Hospital and throughout the region. A healthier St. Louis is a better St. Louis, and we see our role in impacting the social or structural determinants of health every day by serving the St. Louis community. Jones is the president and CEO of DOORWAYS, a St. Louis-based HIV/AIDS housing and support services organization. Under her leadership, DOORWAYS increased the number of clients it serves annually from 1,700 to 3,100 and total annual revenue jumped from $5 million to $9 million.